The emergence of hip-hop out of Queens, NY has proven to be timeless. From Run DMC, LL Cool J, and Kool G Rap to A Tribe Called Quest, Large Professor, Organized Konfusion, and Mobb Deep there's never been a shortage of dynamic music from the borough. Longtime observer and emcee of the culture Truth is set to release his debut album "From Ashes To Kingdome Come" on Ill Adrenaline Records. 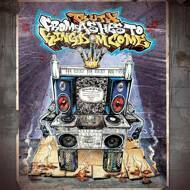 A few years back Truth formed an alliance with PF Cuttin (of Blahzay Blahzay) and together the Queens emcee and the Brooklyn producer/DJ/engineer are ready to release a typical 90's throwback sounding full-length that carries PF's thumbprint throughout. On the 18-track strong heater Truth picks up various topics, ranging from life experiences to repping hip-hop culture - always showcasing his passionate and sharp lyrical rhyme skills. Entirely recorded and mixed by PF Cuttin, the album's raw and dusty sound stays true to the streets, including features from heavyweights such as the late Sean Price, O.C., and AG (of D.I.T.C.). Newcomer JK1 The Supernova handles the majority of production along with veteran producers PF Cuttin, Psycho Les (of The Beatnuts), Da Beatminerz, and DJ Doom. Containing plenty of dope scratches mainly executed by PF Cuttin and Rock Steady's own DJ JS-1, the album's uniqueness remains on one accord with the boom bap sound and origin which is a rarity in today's music.